When I started looking up ideas for making bath salts, the wheels just starting turning and clanking away. Really, you can’t go wrong here. My daughter suffers from eczema and I have my own issues with sensitive skin so I looked up what all the fuss was with bath salts. Taking a soak in a warm bath with sea salts can help with many areas such as improving skin’s condition, the body’s circulation, muscular aches and pains, arthritis and joint issues. 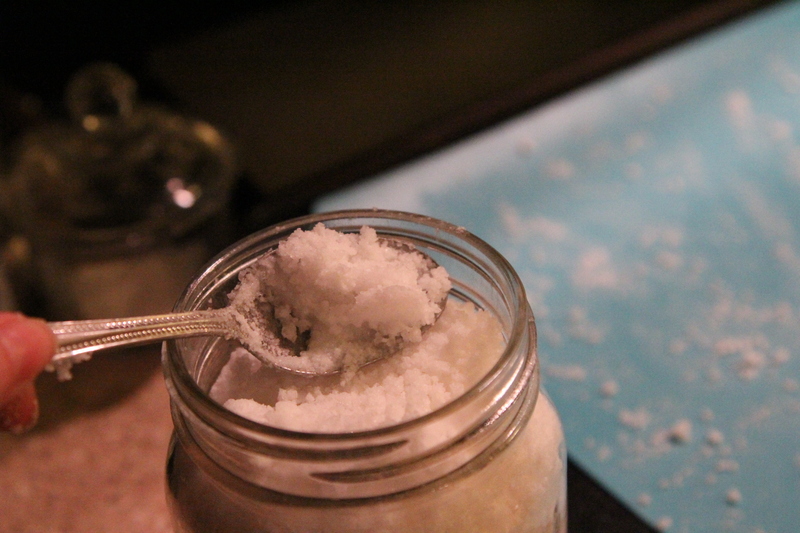 Sea salts contains minerals that aid in healing, detoxifying the body, and cell nourishment. 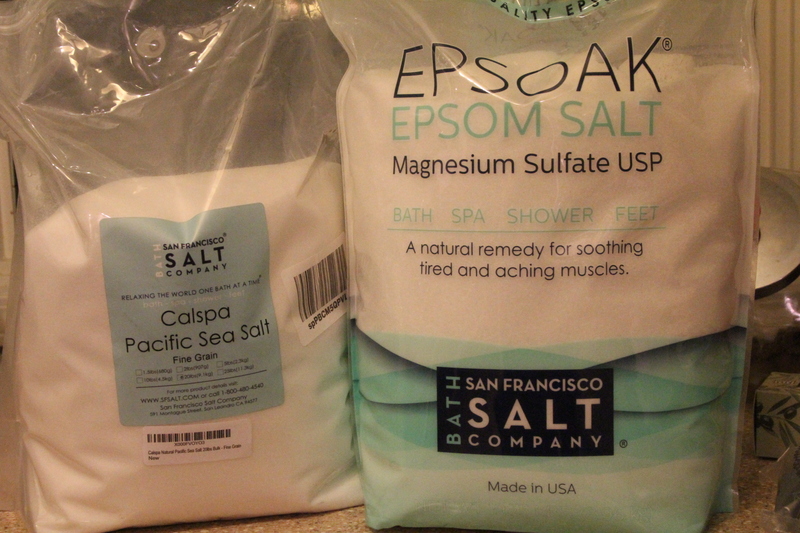 Both sea salts and epsom salts are beneficial for containing magnesium and sulfur which the body can absorb more effectively during the bath than taking an oral supplement. Magnesium helps to regulate the body, helps circulation, increase energy level, improve oxygen use and nerve function, aid in digestion and ridding the body of toxins, as well as stimulates the production of serotonin which improves our overall mood and stress level. I can’t find a reason not to include a cup or so of this wonderful stuff in your tub. 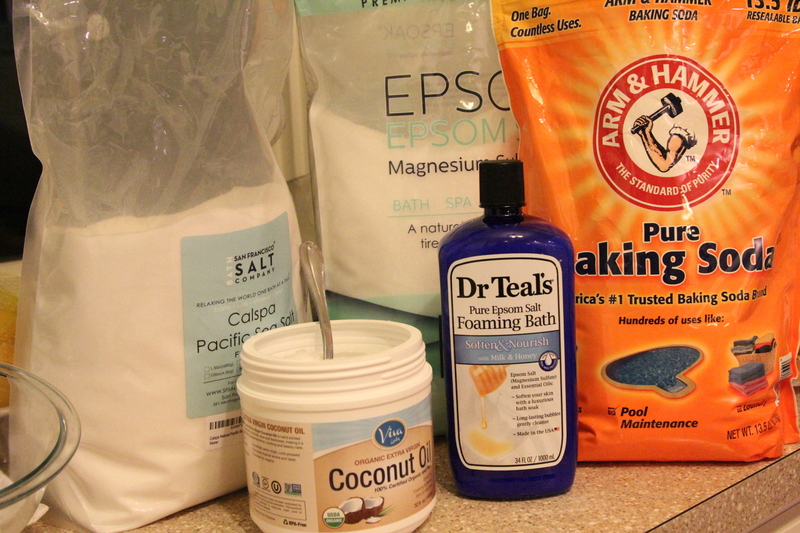 I knew I wanted to include baking soda in my bath salt mixture because it’s also great for softening the skin, aiding in healing irritated or sensitive skin, and also helps to rid the body of toxins. 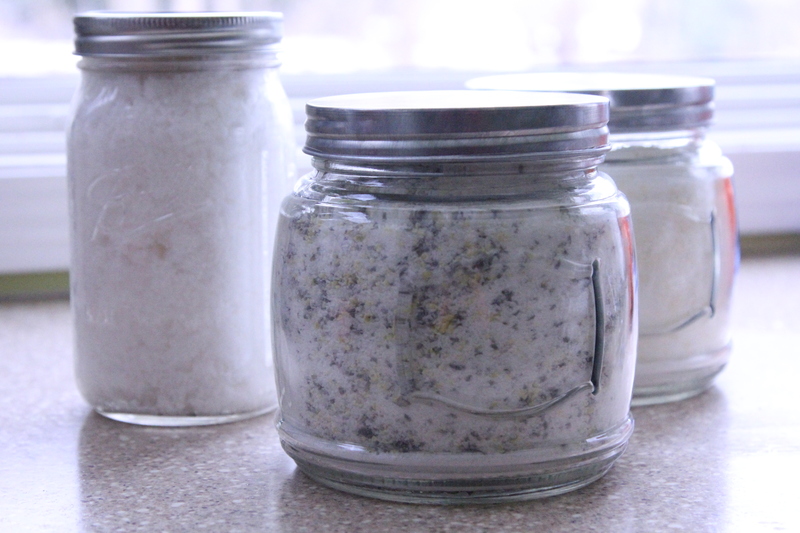 I decided I wanted to make a few different scents of the bath salts, and I wanted one to be more of a dual purpose body scrub bath salt. It’s so hard to narrow it down when you start looking at all the scent varieties and possibilities, but that’s what’s fun. You can customize the scents to whatever you love or if you are giving it as a gift, you can really make it personal. You can keep it basic and not add any scent, it’s whatever you prefer. I can’t wait to make another batch and change up the scents. Now I just need more bathroom storage space for all these salts. So make a batch with your favorite scents and pamper yourself a little. Pretend you are at some peaceful spa getting the full treatment and just ignore those tiny fingers reaching under the bathroom door for a moment or two! I ordered my Epsom Salt and Sea Salt online since I could get a large 20 lb bag of each for around $30 a piece and they would last me a long time. Plus, I love Amazon shopping. I recently began having things automatically shipped monthly, and bi monthly through their Subscribe and Save service. Right now I’m just doing a few items so we’ll see how it goes and if we like it, I’ll add on more. 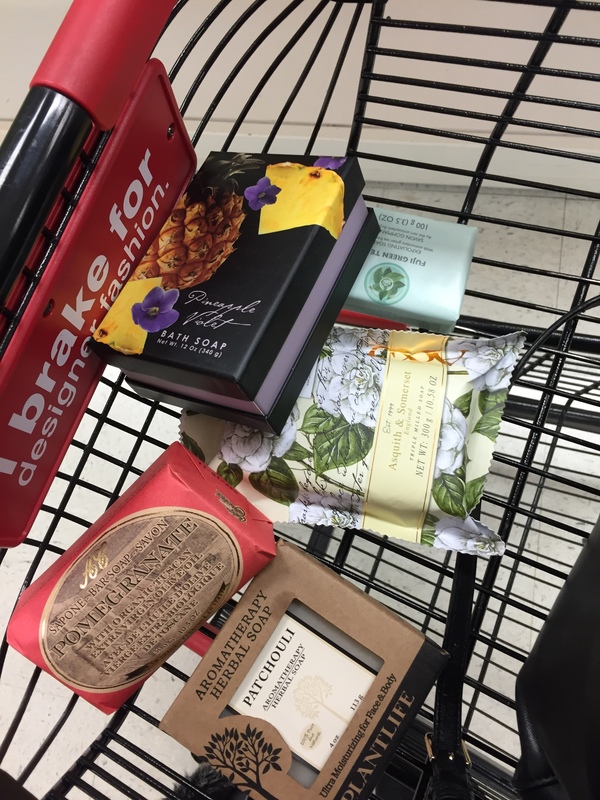 I love to look and smell all the pretty soaps at TJ Maxx and Tuesday Morning. I may or may not have a slight soap addiction now. This was my cart the other day at TJ Maxx. You can also find Yardley soap at the Dollar Store which is a great inexpensive soap to add a little scent to your bath salts. 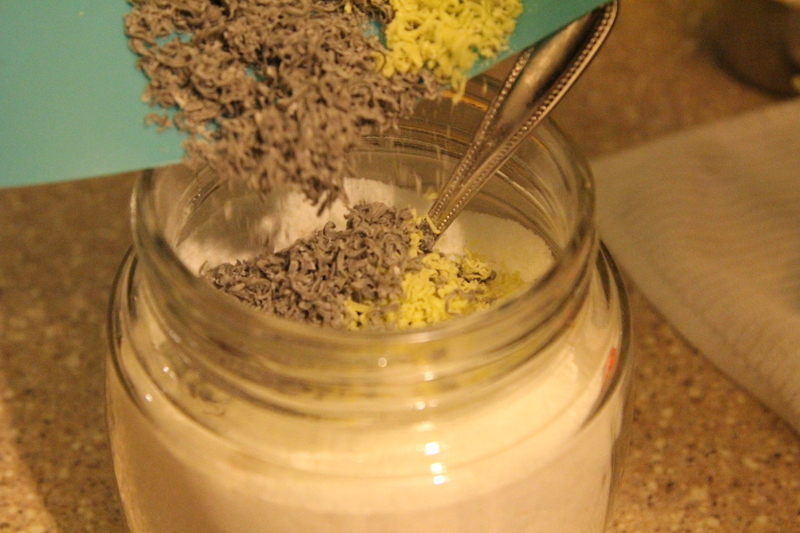 Since I only use about 1/3 – 1/2 C of grated soap per batch, the large bars will last a while and for several batches of bath salts and other projects. I recommend storing the remaining bars in individual freezer bags to preserve the scent as much as possible. You can definitely include more scent options with essential oils, dried herbs, and tea leaves. You can also use a few drops of food coloring in your salts if you want to add color. 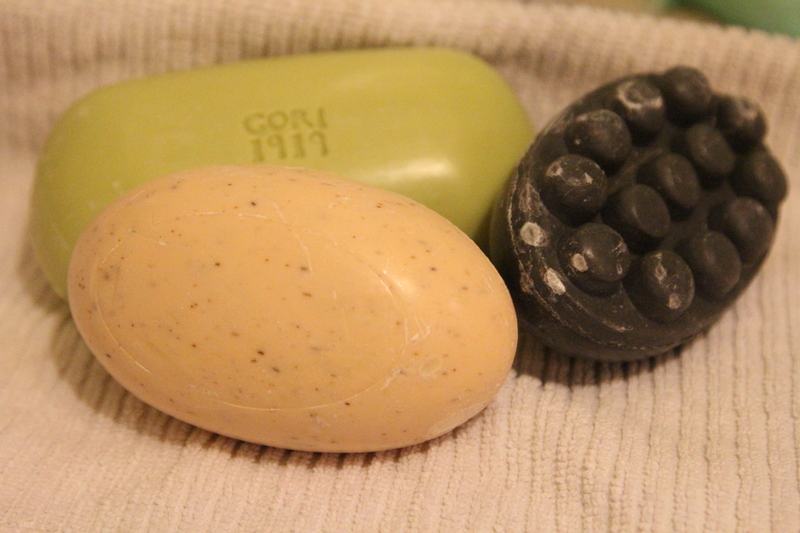 I prefer mine natural, with the added flecks of color from the soap shavings. 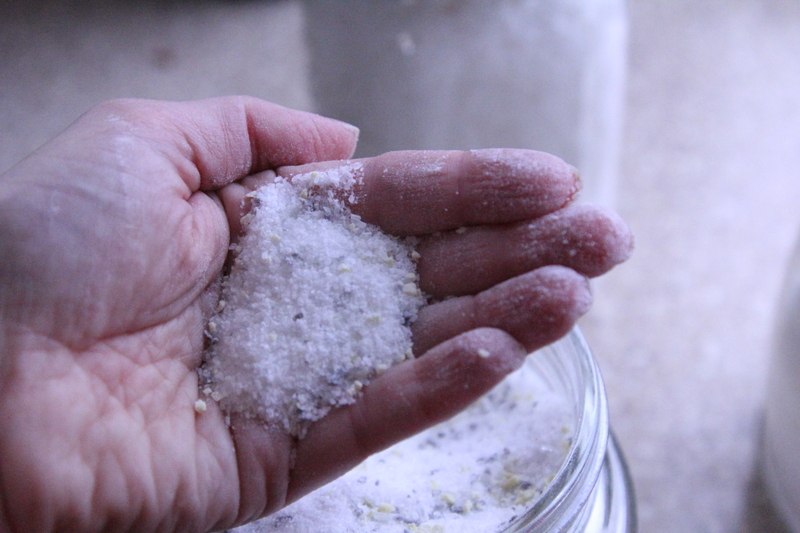 2 C Sea Salt – I used fine grain since I would be making one into a body scrub. 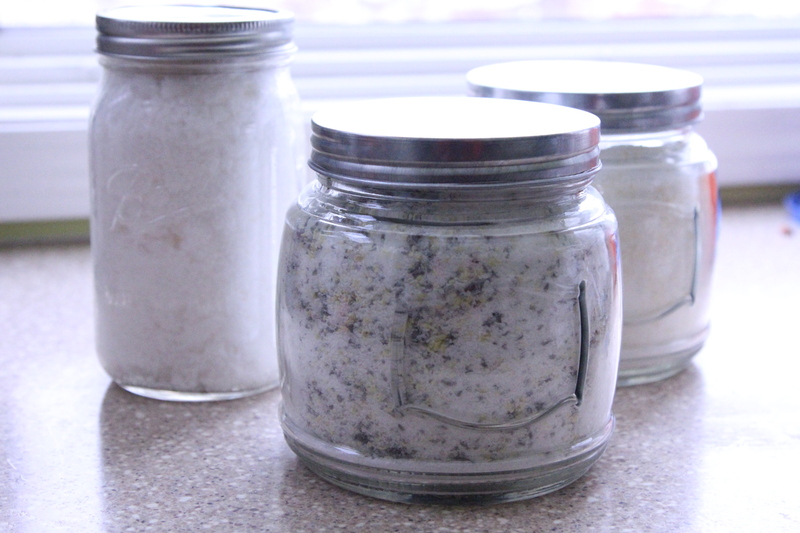 You can use larger grain for your bath salts if you prefer or if that’s all you can find. 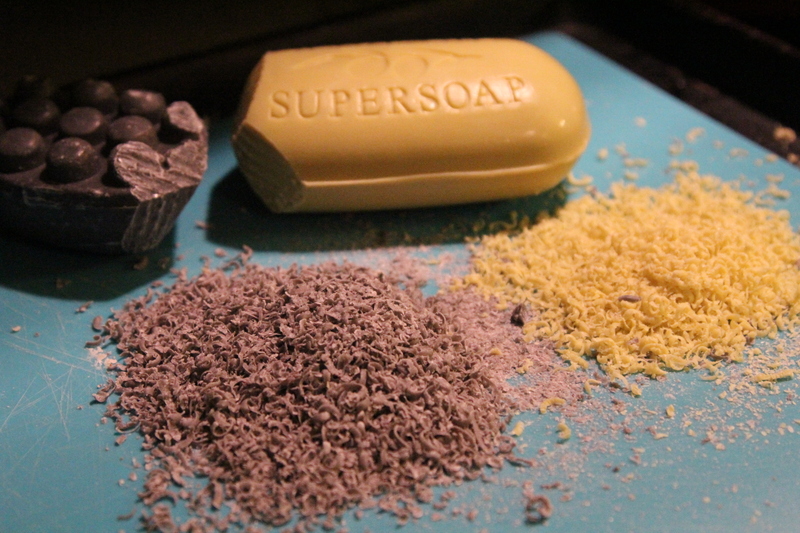 Optional – 1/2 C finely grated soap in the scent of your choice. Optional – a few drops of Essential oil in the scent or combination of scents of your choice. 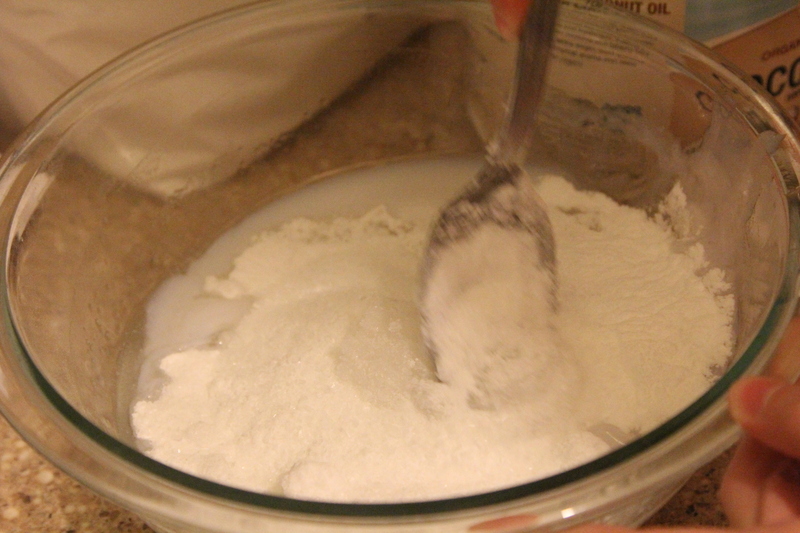 Combine salts and baking soda. Stir in finely grated soap and stir in drops of essential oil and a few drops of coloring if using. Pour mixture into jar or container and secure with lid. 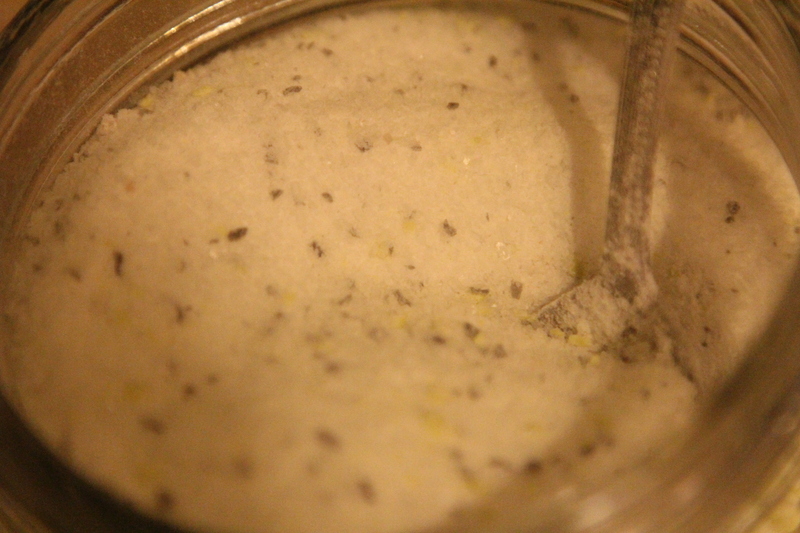 Scoop and pour 1/2 C or more of bath salts into warm running bath water and soak for at least 30 minutes. I made a Refreshing Bath Salt version that had a blend of peppermint oil, a few drops of tea tree oil, and a few drops of a Breathe blend which is a blend of eucalyptus, peppermint, tea tree, lemon, lavender, cardamom, and bay oils. The soaps I chose for this batch were a mild moisturizing olive oil based soap and an oatmeal soap. This Refreshing Bath Salt is great for someone who is congested, dealing with a cold or allergies. The peppermint in the oil is a natural coolant and my body actually feels tingly when I get out of the tub so it is also great for cooling the body down and for sunburns. I made another batch that was a warm spicy scent, with lots of patchouli. You know – my favorite scent. Same base Bath Salt recipe as above. 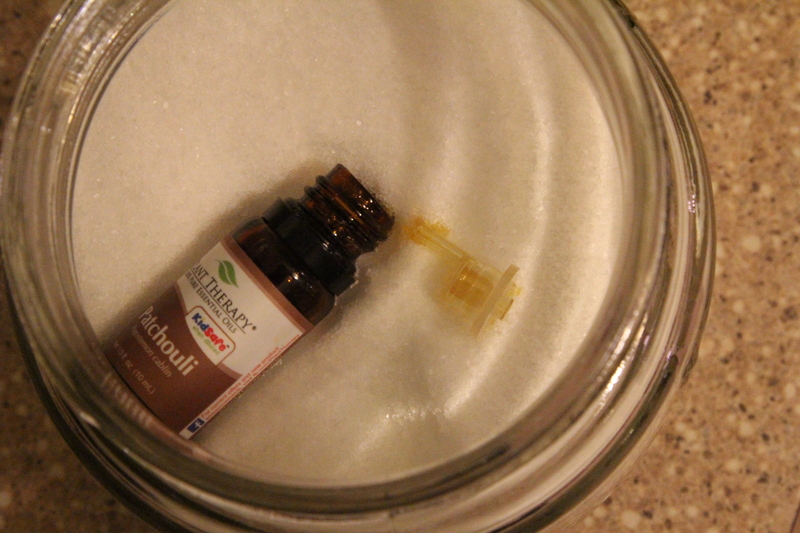 I had an empty bottle of patchouli oil so I put it in the jar with the salts and closed the lid tight and let it sit overnight so the salts could absorb the scent. The next day, I removed the old bottle, added a few more drops of the good stuff from a fresh bottle and then grated in some spicy dark charcoal soap, a little of the olive oil soap, and some vanilla. Oh, it’s wonderful! 1 C liquid body wash, bubble bath or bath foam of your choice. I chose a natural Epsom Salt milk and honey bath foam. **note** a few websites I reviewed when trying to get ideas said to stay clear of using a castile soap for this as it may glob up more during storage, but I did not try this myself. Combine all ingredients into a bowl, just cut in the semi solid coconut oil with fork or hands and mix up. Transfer to your container. Since this has the liquid body wash, it’s best if you use it within 3 months. It may clump and harden during storage, just scoop with a spoon or scoop. I just use a measuring cup. During bath or shower, scoop out a little and scrub it on your wet body. Be very careful on face. Rinse well. I like to add the Bath Salts to my bath water and then also use the Body Scrub to exfoliate. You can just add the Body Scrub to your running bath water without using it as a scrub if you prefer or have very delicate skin.